This week in the Spotlight we are featuring Sprout English’s NEW lesson on Regular and Irregular Plural Nouns. After you try this lesson with your young learners, give them a bit more practice with this silly sock game! 2. Place the flashcards inside a container or envelope. 3. Hang up the regular socks beside each other (where students can reach). 4. Hang up the irregular socks beside each other (where students can reach). 5. Place the blank strips of paper and pen on a table or ledge near the socks. 1. Choose a flashcard from the envelope/container and write the singular word on the board. 2. If the plural of this noun has a regular ending (only need to add -s), stuff the flashcard into one of the regular socks and write the plural word on the paper strip. Put this strip into the other regular sock. 3. If the plural of the noun has an irregular ending, stuff the flashcard into one of the mismatched socks and write the irregular plural form on a paper strip and put it in the other mismatched sock. Continue until all of the flashcards are gone and the socks are full! 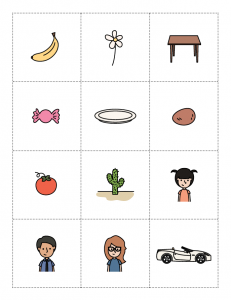 Add new flashcards as you learn new nouns and play another round another day.